This project was a complete garden makeover .The clients had a design for the garden with a few set requirements they wished for. As the existing lawn sloped towards the house they requested a level lawn, the shed base extended and the garden terraced. The brief was to lay a patio at the back of the house with steps and a path leading to a small seating area at back of the garden. Then a path leading around the side of the house to the front door. 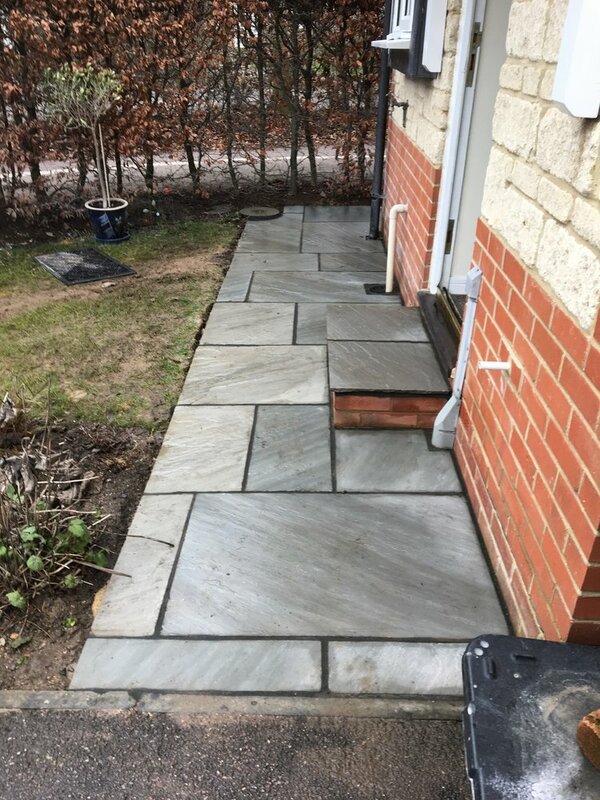 The choice of paving used was sandstone light grey. The first job was to remove the old grass and then lift all the old paving. Then excavating the areas that were to be paved ready to put down a compacted scalping base. The paving was then laid on a sand & cement mix, with the steps constructed and the upper path and seating area laid. To finish a dark grey pointing mix was used to complement the slabs. The sleeper retaining wall was constructed by fixing the sleepers to posts set in the ground as was the wood used to retain the lawn. This was constructed to level the lawn as requested by the client. 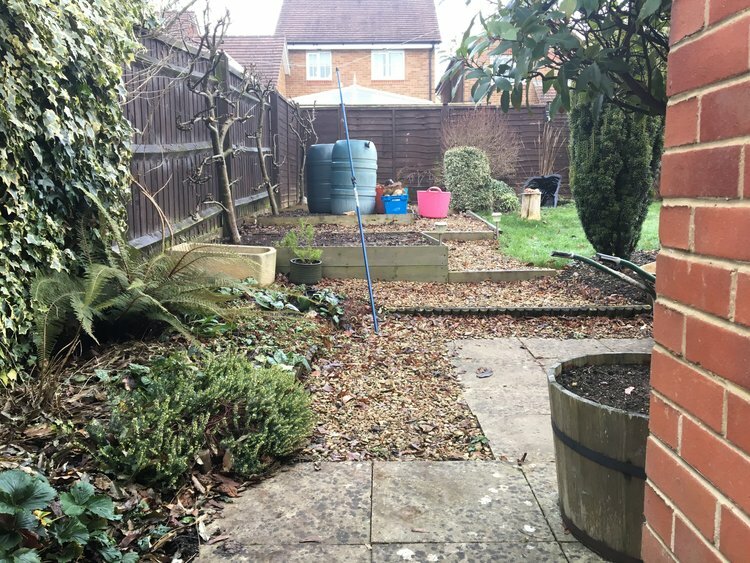 Creating a level lawn brought about a new set of problems being that the soil beside the upper path and seating area was higher than them, this was overcome by using the paving vertically to retain the soil. 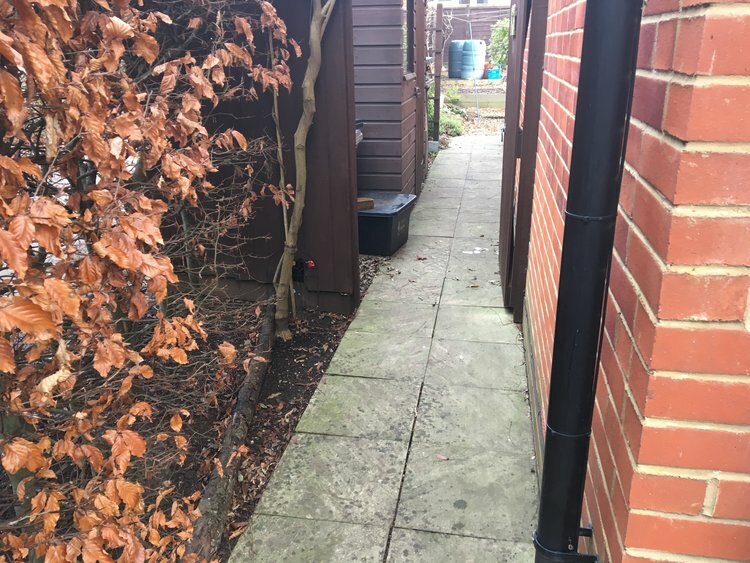 The paving was used to bring a uniform look and achieve the request of not much wood being used. The soil which was excavated from the patios and paths and piled in the garden was levelled to the new edges of the new lawn. This was levelled and prepared for turfing using Rolawn Medallion turf. On this project I had a mixed bag of weather from sunshine, freezing cold, wind and the rain!